Do you ever need a gift for a friend but don’t necessarily have the time or money to go out and buy them something incredible? I’m a firm believer that you can DIY a thoughtful gift on a budget. A friend’s birthday was coming up, and I wanted to make her a little gift that was easy to ship, inexpensive, and colorful. My mission was to make her something fun using supplies I already had. So, I scrounged through my craft supplies and found a pack of neon card stock. I knew this paper would be perfect for my color-loving friend! 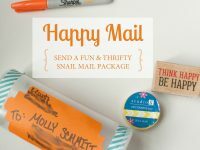 She also shares my love of snail mail, so I decided to make her a set of vibrant cards to add to her stationary stash. Side note: This project is part of the Silhouette Challenge, where 16 of my Silhouette-loving friends are all sharing projects on our blogs today. Our theme is $5 & under projects, so make sure to scroll down to find links to all 16 thrifty project ideas. Sitting cross legged on the living room floor with Gilmore Girls as background noise, I opened my Macbook and set out to design the cards using my Silhouette Studio software. There were three colors of paper I wanted to use, so I decided to create three card designs. My final design was a flat note card with rounded edges and cut-out text along the bottom. 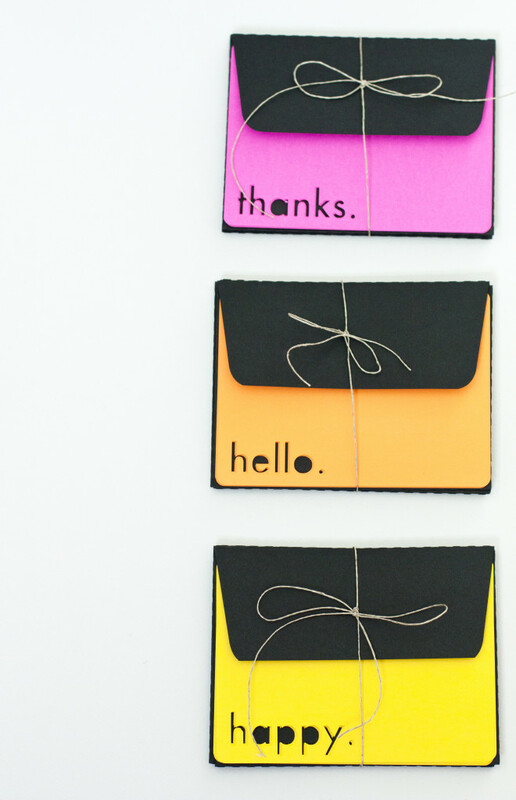 I decided the words “happy,” “thanks” and “hello” would match the cheery feel of the neon paper. Once my design was complete, I stuck a piece of the bright card stock onto my cutting mat and loaded it into my Silhouette Portrait (affiliate link). If you do not own a Silhouette, I highly recommend it. Mine was a Christmas gift last year and has become one of my most-used gifts ever. I use this cutting tool all the time. Seriously, take a minute and add it to your wish list right now. If you have questions about it, leave me a comment. I’m happy to tell you more about how I use it for all sorts of crafts and decorating projects. I was able to fit two cards on each 8.5 x 11 inch page, and I cut out six total cards of each of the three designs. After cutting each page, I simply pulled the card stock off of my cutting mat and then used a scraper tool to remove the excess paper still stuck on the mat. 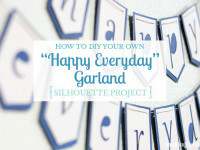 This is a super easy, beginner Silhouette project. After cutting the note cards, I decided they needed envelopes so I could package them as a nice little gift set. 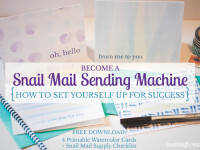 Instead of experimenting with my own envelope design, I decided to save time and find an envelope download from the Silhouette Design Store. I purchased this envelope cut file download for only 99¢. I liked this style of envelope, and it’s awesome because I can open it in the design software and resize it to fit any card. I chose to cut out the envelopes on black card stock. I like the black contrast with the neon cards. I love that the Silhouette not only cuts, but also perforates. After my envelopes were cut out, all of the fold lines were perforated to make folding them a breeze. I used two small pieces of double stick tape to hold the envelope sides shut. I love how these note cards turned out! I made a little set of note cards and envelopes for each of the three designs, and tied the sets together with some string. I think bundling them into sets really completes this project if you’re giving it as a gift like I was. Since I was mailing these, I simply stuck the three bundled sets into a bubble envelope. I also tucked in a silver Sharpie so my friend could use it to write on the black envelopes. This made such a cute, cheerful gift. It didn’t take me a ton of time or cost me very much, but it’s a handmade gift that was useful to the recipient. 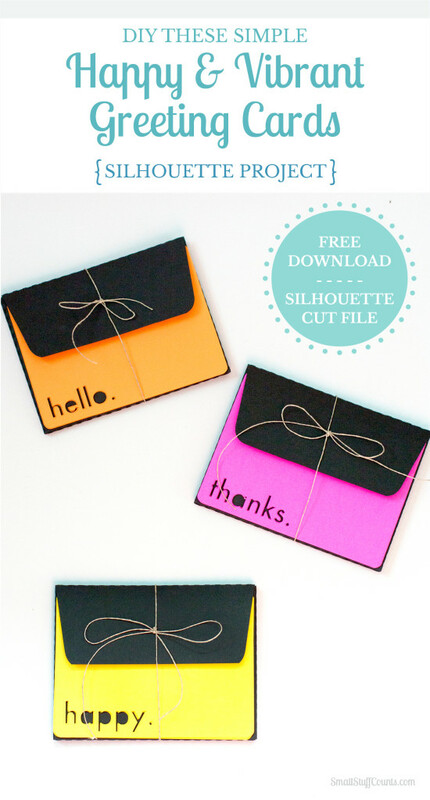 You are welcome to download the free Silhouette cut files for the three card designs I made. These are available for personal use. Since I did not design the envelope, you’ll need to either create your own or download one. Here’s the design I purchased for 99¢. Would you love to receive one of these vibrant notes in your mailbox? I want to make a set for myself next, but need to decide which words to cut on mine. Any ideas? Leave me a comment! Note: The links above are affiliate links, meaning I may earn a small commission if you use them to make a purchase. I only promote products that I have personal experience with and that I feel my readers will enjoy. 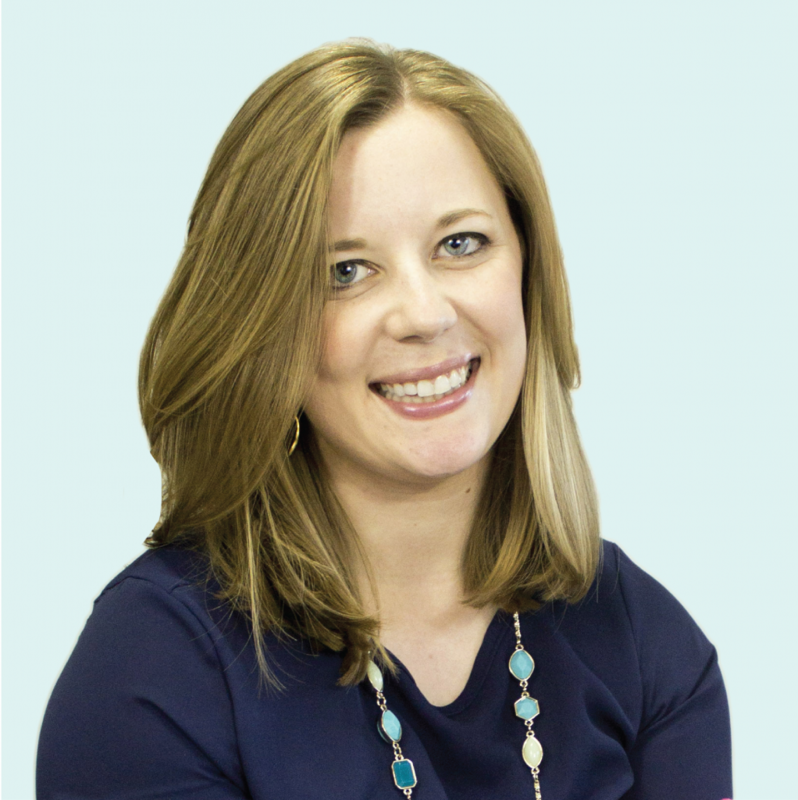 Thanks for your support of this blog! My Silhouette Challenge friends and I are all sharing projects on our blogs today, so peruse the projects below for a wealth of thrifty Silhouette inspiration! Those definitely stand out. Such a fun design! Thank you! The neon paper sure catches your eye, right? Thanks for stopping by. These are so cheery and fun! I always forget how easy it is to make cards with my Silhouette…especially a simple design like this, little effort and big impact! Thanks for the inspiration! Thanks for visiting, Meredith! 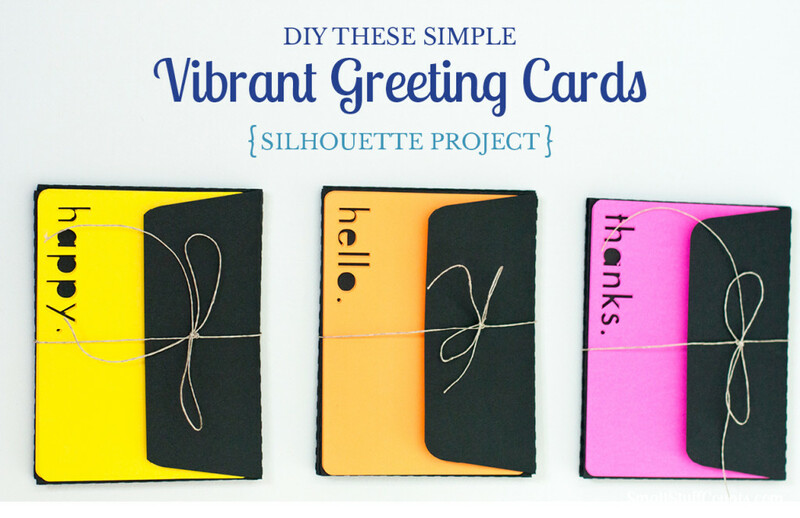 It sounds like you need so spend an afternoon whipping up some cards with your Silhouette. Such cute cards, and a lovely gift idea. Sadly I am currently a silhouette free zone, but maybe one day! One day, Julie! Silhouettes are bomtastic, but in the mean time you can make tons of crafty things without one. 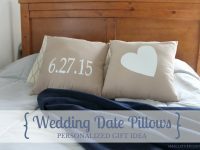 Fabulous idea for a gift and so useful too! I love the minimalist look of the cards and that the colours pack such a punch! I think the neon and black looks so sharp together that you kinda forget they’re just a few pieces of paper. Thanks for visiting! What a thoughtful gift. Simple and understated, but packing a punch of color, especially against the black envelopes. I’m sure your friend will love them! Love them all! So pretty and what a great way to greet!!! Wouldn’t you be so excited to open up one of these envelopes and pull out a neon card? Thanks for visiting! Love how bright and simple these cards are! Thanks, Rachel. Sometimes the simple ideas are the best. Those are great! I really like how the bright colors pop against the black envelopes. Thanks so much! I loved the neon, but think the black envelopes really complete this project. You are very welcome! I’m always happy to share my files with friends. Thanks for visiting today! These are so cute and such a fantastic idea!